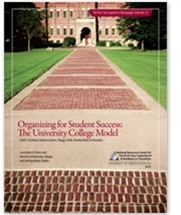 Organizing for Student Success draws on data from more than 50 institutions to provide insight into how university colleges are organized, the initiatives they house, and the practices in place to ensure their effectiveness. Twenty case studies from 15 different campuses offer an in-depth understanding of institutional practice. Ultimately, university colleges are not only a structure for organizing educational experiences but also a catalyst for creating institutional change. An invaluable resource for first-year experience steering committees, general education reform committees, and other groups or administrators charged with reorganizing and revitalizing the delivery of undergraduate education.